NCrunch Forum » General Support » Daily Usage Issues » Navigate to tets displaying coverage when lost in code? Navigate to tets displaying coverage when lost in code? 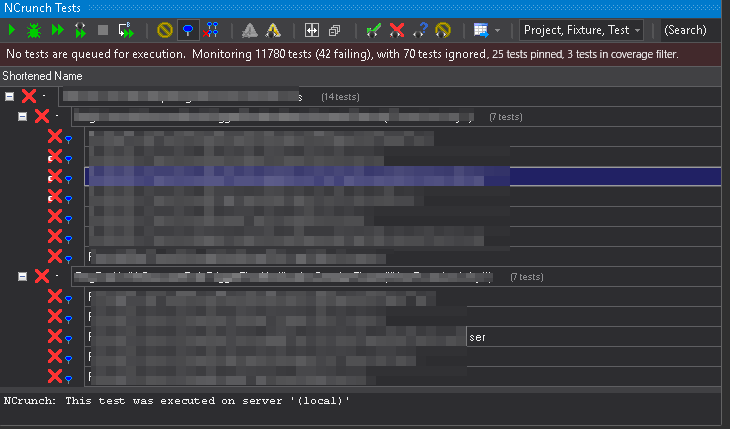 So today I got back to work with a vstudio full of gray dots and a NCrunch window "code coverage has been set to show 1 test only" and don't remember which test I had filtered coverage for (I found it without too much of a hassle though). Is there a neat trick to navigate to that test without first having to find the coverage dots in code? I just realized a shortcut "Focus next covering test in Test window" would be neat, where if you currently have cursor on a gray dot it selects next arbirary test showing any coverage. Although I guess "focus' would be a new domain term in addition to "pin" which might not be desirable. This isn't very obvious, but one thing you can do is open up the Metrics Window and look for files with code coverage in them. The Metrics Window should be filtered by this feature in the same way as the code windows. If you're encountering this situation often, it might be worth using an engine mode that only shows coverage for pinned tests instead of the inline coverage filtering feature. This would probably give you a better UX, but I accept that it would only be possible if you weren't already using pinned tests for something else. e.g. something like below (but with a more stylish overlay icon :)). (The "25 tests pinned" text feature requests exists here).